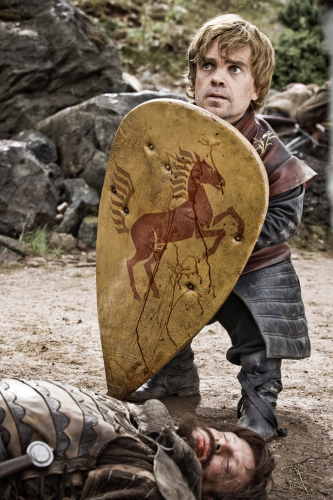 The youngest son of the powerful Lord of Casterly Rock, Tyrion is known far and wide as the Imp. Bearing the shame of being a misshapen dwarf, Tyrion makes up with wit and intelligence what he lacks in good looks or strength. 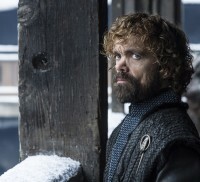 Though the Lannister family is believed to be a particularly well-knit clan, in fact Tyrion is hated by his father (who believes his dwarfism is a punishment from the gods for his sins, and who blames him for the death of his mother when she gave birth to him) and detested by his sister. Ser Jaime has always treated him well, however, and the two have a mutual love and respect for one another. Tyrion’s legs are stunted and twisted, making walking for extensive periods painful, but his arms are surprisingly strong. His forehead bulges unflatteringly, and his eyes are mismatched, one the Lannister green and the other nearly black. His hair is a mixture of gold and platinum strands. How far the actor will be made to look like the book description of Tyrion is an open question. In the novel, Tyrion is in his mid-20s, but he will likely be aged upwards for the series.